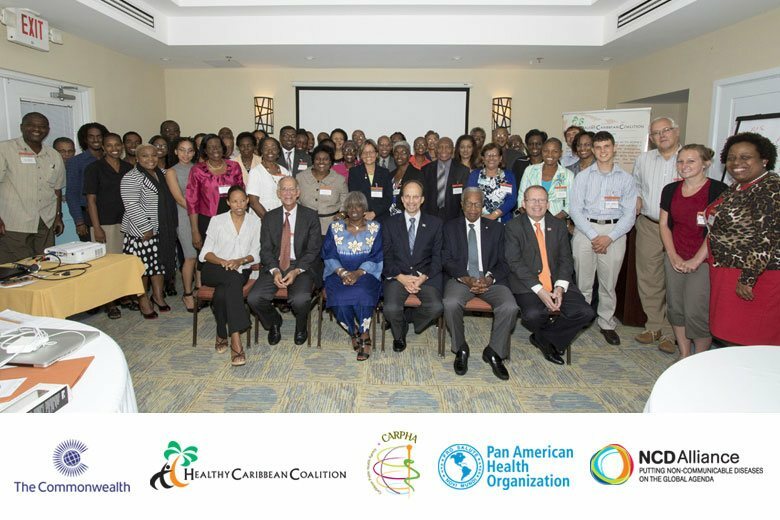 Friday June 5th, 2015 at the Courtyard by Marriott Bridgetown in Barbados, key stakeholders came together to discuss strengthening of the multisectoral approach to NCDs through CARICOM’s National NCD Commissions (NNCDC). Fifty-two members of the public sector including NNCDC ‘Chairs’, civil society and the private sector participated in the 1-day meeting ‘Strengthening The Multi-Sectoral Response to NCDs in the Caribbean: NATIONAL NCD COMMISSIONS’ aimed at discussing the experiences, challenges and successes of NNCDCs to date and mechanisms for operationalising and strengthening NNCDCs as key instruments of a whole of society approach to NCD prevention, treatment and control. Opening remarks were provided by The Hon. Minister of Health Mr. John Boyce, Dr. Magna Aidoo (Commonwealth Secretariat), and Sir Trevor Hassell. The key outcomes of the meeting were: increased awareness of the multi-sectoral response to NCDs in the Caribbean with a focus on NCD Commissions and their equivalents; finalisation of the National NCD Commission Implementation Framework; and gaining consensus on the scope of technical support for the strengthening of selected NCD Commissions. Regional and global NCD leaders and champions including Sir George Alleyne, Dr. James Hospedales and Dr. Cary Adams repeatedly underscored the critical importance of a multisectoral, whole of government, whole of society, health in all policies approach to NCDs. Dr. Alafia Samuels presented the NCDA funded HCC report on NNCDS in the region and Mrs. Carter-Taylor presented the COMSEC funded HCC draft implementation framework for operationalising effective NNCDCs. Against the background of a global NCD crisis, there has been increased international attention focussed on multisectoral NCD Commissions. The Caribbean has an important role, as leaders in this area, to document regional experiences and to develop models which can be adapted and translated globally. This meeting was supported by the Commonwealth Secretariat. Official meeting partners included the Pan American Health Organisation (PAHO); the Caribbean Public Health Agency (CARPHA); the NCD Alliance and the Barbados Ministry of Health. The work of the HCC would not be possible without the kind support of Sagicor Life Inc.